Whilst the vehicle can take many forms, every AGV includes the following components. Payload interface. This may be a fork, platform, conveyor, liftdeck, and may be configured to engage with external devices and systems. All AGVs include appropriate safety systems to ensure that hazards are avoided, and collisions with people and surroundings are eliminated. On-board batteries obviously require charging. Charging systems may be designed to charge the batteries on-board the AGV with the AGV automatically returning to the charging point when necessary, or may involve either automatic or manual battery exchange for applications where true 24/7 operation is required. The fixed infrastructure of the AGV installation will communicate over a physical network. The main controller communicates with peripheral devices via Ethernet. The peripheral devices may themselves communicate with other devices using common protocols such as Modbus, CAN and OPC. Some devices communicate via digital I/O. The vehicles require a navigation system that provides the ability for the vehicle to identify its position. Various navigation systems are available. See our Navigation Systems page for more information. The central controller provides the traffic management system that organises and controls the movement of the AGVs around the area of operation, ensures that AGVs interact with each other to avoid collisions and blockages, and interfaces with external components such as lifts, doors, conveyor systems and other devices. 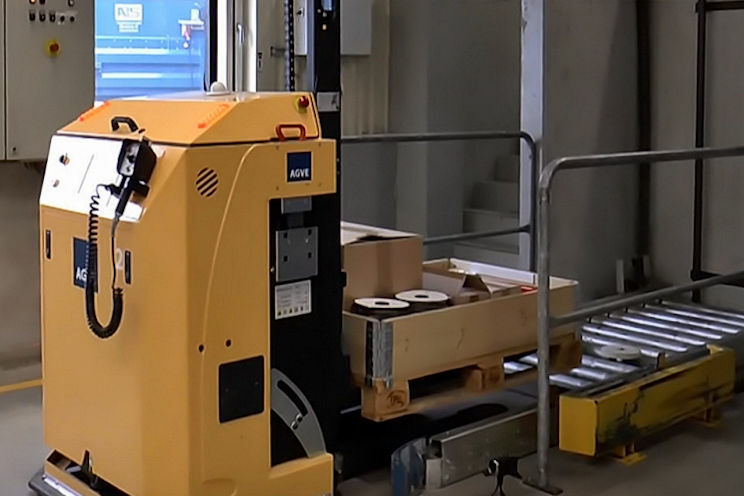 Not only must the central control system organise the movement of the AGVs around the facility, it must also collect the job initiation commands and manage the uplift and discharge of the payloads by the AGV system. The process of matching the job requests to the route may be initiated manually through e.g. a touch-screen or bar-code scanner or may be generated automatically via an interface to a WMS/ERP system. Many AGV installations engage with external components such as buffer conveyors which aid the overall process. Where interface is automatic the AGV control system must generate and receive the appropriate commands.